The New York Times’ much-vaunted weekend report on Benghazi is tough reading — and not just because it purports to tell the story of one of America’s darker days since September 11, 2001. It’s tough to read for anyone who’s familiar with comprehensive after-action reports of terror attacks, firefights, IEDs, mob violence, or other significant kinetic events in war (often known as SIGACTS). By comparison with those, there’s just not much in the Times report. But the report is not without some merit, so let’s break it down into the good, the bad, and the pathetic. First, the good: Times reporter David Kirkpatrick did what the American security establishment has apparently failed to do in more than a year since the Benghazi attack — get face-to-face with key players on the ground in Libya. While he’s entirely too credulous in relating their account, he does provide a vital sense of the mish-mash of competing militias and loyalties within Benghazi in the days and weeks leading up to the attack. And at least one part of the account rings true for those of us who’ve spent time in the Middle East: that the initial assault was soon supplemented by a rumor mill (that Americans were shooting unarmed Libyans) that greatly swelled the attackers’ ranks — at least after they’d already taken the compound. If you want to know how the Benghazi militias spin the story, read Kirkpatrick. Next, the bad: Unfortunately, however, as an account of an hours-long battle, the story fails. Somewhere, buried out of reach (for now) of any American news agency, is a minute-by-minute account of the fight in Benghazi on September 11, 2012. This account no doubt cross-references the testimony of those on the ground with the available signals intelligence (including radio intercepts from the attackers themselves). This account tells us when American command authorities were made aware of the attack, when the news was forwarded up the chain of command, and who made what decisions that fateful night. These facts exist for virtually any American action of consequence in the War on Terror, and an excellent example is reprinted in Dakota Meyer’s and Bing West’s outstanding book on Meyer’s fight for his life in Ganjigal, Afghanistan. When my unit was in the thick of the fight in Diyala, Iraq, we created reports of engagements far more comprehensive than anything yet seen on Benghazi — including this Times report. Until we see at the very least a properly redacted version of the truly “official” account, the battle at Benghazi will remain a deep mystery — one of the most mysterious of the entire War on Terror. In the meantime, Kirkpatrick’s account is sketchy, at best. A few attackers show up and breach the gates, a larger crowd follows (motivated apparently by rumors of American shootings and perhaps the infamous YouTube video), then mortar rounds hit the CIA annex many hours later. That’s pretty much the story. For those of us who wonder why there was no real effort to support and defend Americans under fire and outnumbered in a hostile land, this is thin gruel indeed. Finally, the pathetic. While some have cast the story as helpful to Hillary Clinton and the administration, it actually amplifies some of their key failures. It’s pathetic that we failed to heed ample warning signs, including attacks on our own compound. It’s pathetic that we provided such inadequate American security that a small group of attackers were able to breach the gates with ease (It’s telling that the few Americans actually had to run to grab their weapons; they weren’t already armed). It’s pathetic that they had no help under fire. It’s pathetic that one reason why they had no help is that we placed American lives under the protection of Libyan militias. The greenest platoon leader in my regiment in Iraq could have (and would have) devised a better defense. And it’s especially pathetic that Western journalists keep interviewing the prime suspects while our own government either cannot or (more likely) will not do what it takes to bring them to justice. A sealed indictment? Our enemies tremble in fear. It’s pathetic that we keep circling back to a YouTube video to explain Benghazi. 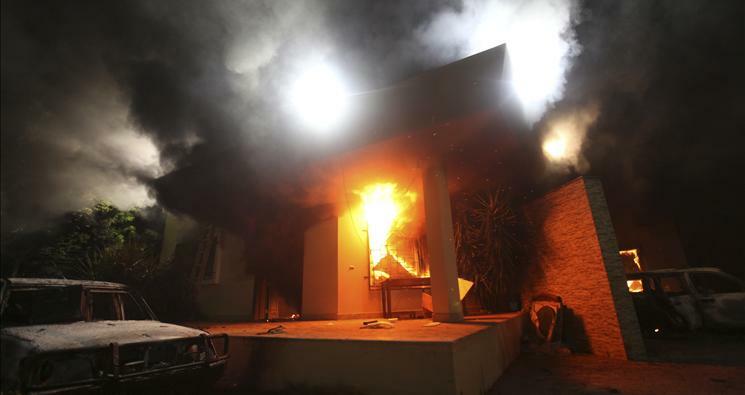 Did the YouTube video motivate previous attacks in Benghazi, including a previous attack on our own compound? Did a YouTube video motivate Libyan militias to shows of force under the black al-Qaeda flag? Did a YouTube video enable the militias to so carefully scout American positions that they were able to land multiple direct hits on the American CIA annex? At best (and this is being charitable to the reporting), the available evidence indicates the video may have influenced the attack’s timing, but not its motivations nor the capabilities of the attackers. How long must we chase our own tails? Jihadists attack us, and yet we think if only a Florida preacher didn’t burn a Koran, or if only Danish cartoonists put down their pens, if only cranky felons didn’t make cheap YouTube videos, or if only our soldiers didn’t commit one of the innumerable warned-against slights while deployed downrange, then the haters won’t hate, jihad will truly become an “inner struggle,” and peace will reign. What’s most pathetic of all? That 65 years after Arab armies launched their first war of extermination against Israel, 34 years after the hostage crisis, and twelve years after 9/11, we still don’t understand our enemy, and we still blame ourselves for their reckless hate. This article is crossposted on National Review.